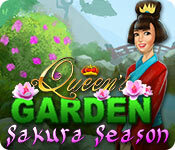 Queen's Garden Sakura Season is rated 4.4 out of 5 by 27. Rated 5 out of 5 by ZoxSox from My favorite challenge and relaxing game I was surprised to see such a well-created game. You have to match different objects, but they have various features that make it interesting. 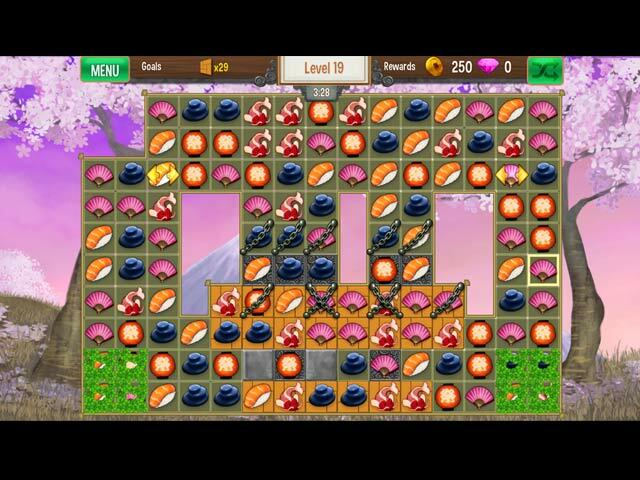 As you go through the levels (over 100), you receive items to put into your Japanese garden. Mine was gorgeous, and I love this game. (Ironically, it is a Chinese-made game because the visitors to the garden are obviously Chinese, not Japanese - but if you don't know the difference in the cultures you wouldn't know.) Beautiful objects to win, loads of pretty flowers, fountains, Buddhas, bridges, gazebos, cherry blossom trees, just a lot of things. It was fun to go through each level and then you'd "win" an item to use which you could go and purchase more of with your points. It's very creative. I love this game, and the music was soothing, the colors bright, the garden really well done (although you make it your own). I highly recommend this game for people who like to create something that's not with dorky characters or junky items. I wish there were more to this, such as a series of settings to create. Five stars! Rated 5 out of 5 by Mouse381 from A Go To for when I need to wind down First off: I could do without the pieces flying like whirly birds when collected. Very distracting. BUT! This is my only qualm! This game is a stress reliever. It has been stayed put in my game manager since purchase. I play it, if even for only a few levels each night before bed. 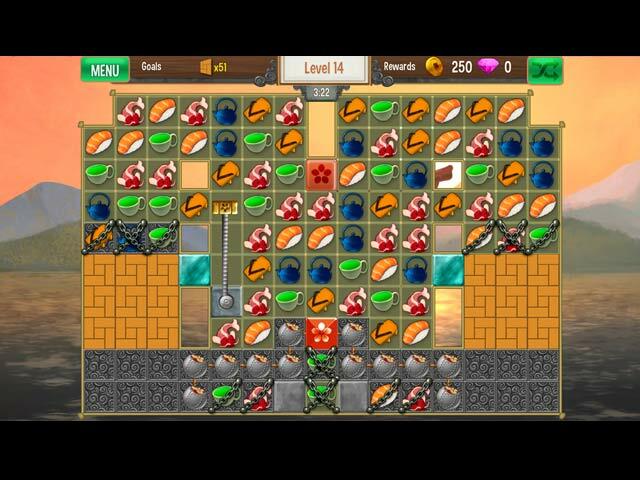 It is a usual M3 game, with the the bombs after combining 5+ or clearing a row/column after combining 4, etc. There are levels that require a certain amount of items collected before completion...20 Teacups and 30 Cranes. (Hence the first comment...as they are collected, they go flying across the board like whirly birds before being counted. Makes it hard to see the board for 1-3 secs.) Also, there are some levels that require a certain # of flowers fall off the board or paintbrushes be collected. Then you have different options to purchase walking stone paths, plants, trees, statues, ponds, benches, lights, even sand plots to decorate your garden. There are 6 gardens(some unlock after certain levels) total. Very relaxing and a good stress reliever! Rated 5 out of 5 by euphoria from Sweet and Relaxing My problem with Match-3 games: they get WAY too difficult in the upper levels and I give up in frustration. This is so different! Choosing relaxed level, the challenge is enjoyable and piques my interest, but doesn't annoy or frustrate. Earning coin to furnish my beautiful Japanese garden is the goal, and what fun it is! I'm especially proud of my super lush digs, but with such beautiful accoutrements to choose from, even the weakest "designing eye" can create a virtual paradise. Oh, to be one of those tiny characters walking amongst the beautiful ponds and plants in my gorgeous garden! Rated 5 out of 5 by shirleykr from Love this game Good paced match 3, and not really hard. I have all the Queen's Garden games and like them all but this one is the best. So many choices and I really like the big pond choices. The best part about these are you get to design the garden and place items where you want them no matter how it looks. Also like the wasps help. Fun game. ,,,,, Please design a Christmas themed Queen's Garden, it would be an instant buy (no trial) for me. Maybe have angels help instead of wasps. Rated 5 out of 5 by azenalyn from queens I so loved this game. Graphics are great. The music is very relaxing and just the thing after a hectic day. I really wish the developers would make another one. I want to start a new garden but don't know how to do that without deleting game. anyone have any ideas? I highly recommend this game. Rated 5 out of 5 by mikesilverman from MATCH - 3 AND A GARDEN? YES!!! EXCELLENT!!! When I first saw this game I said to myself "eh.. a garden... yawn.". But after I started playing this game and realized how creative and interesting you could make this garden I really began to love it. You can play this game simply as a match-3 style game and ignore the garden-building part of it, but you really would be missing some fun if you did not try making a garden. 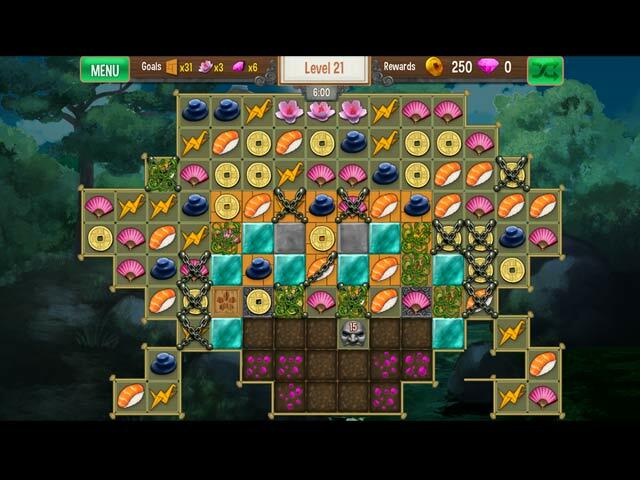 The more you play the match-3 and win, the more gold and gems you get to spend on a variety of trees and flowering shrubs and man-made artifacts for the garden. The match-3 is beautifully designed with a definite Japanese theme to the tiles which includes sushi, teapots, yin-yang symbols, origami swans and so forth. There are no power-ups that sit outside on the edge of the match-3 game board, you create power-ups by forming matches on the board. Match 5 tiles and you get a bomb that will blow up 4 squares, match 4 tiles and you will get a special tile that will wipe out all tiles in a row or column the next time you use it. match tiles together in an L shape and a wasp will appear on the game board and when you swap it with any other tile a flock of wasps will appear to remove all tiles of that same variety. The match 3 is at a nice challenge level without being "too" challenging to complete. Building the garden is a lot of fun if you choose to do that. You can add all sorts of flowers, trees and bushes, stone walkways.. and there are and-made items you can add as well. For example you can add a variety of benches to the garden. There are little animated people who will roam around your garden and some of them will sit on the benches you add. You can put up a gazebo and they will walk into it. You can also add bridges , and a pond with animated fish that swim around, tables with tea sets on them, you can really get creative. I wish there was an option to use the garden I create as a stand-alone screen-saver for my computer. That would be great. Maybe they will put that feature in a future version of this game. Rated 5 out of 5 by sbechirian from Nice match 3! What I like about this game is that you have to use your imagination to build your own garden. The music is superb and the sound effect as well. Really zen and relaxing. I don't get bored. Rated 5 out of 5 by Starswim from Beautiful Zen Wow this is the best of the Queen's Garden series! It's a stress killer - and so beautiful. It smooths away your hard day...you can set it to relaxed and better still you are given a further option to stop the growing weeds...for a fully beautiful zen experience freeing you up to build a gorgeous garden of your own creation. In fact you can build more than one garden at a time. Absolutely wonderful! So nice to have something of beauty to pass the time instead of ghoulish dark evil stuff...this is a lovely game. Treat yourself...enjoy it! Rated 5 out of 5 by lbtgam222 from Was hoping for Xmas Queen's Garden, but i'll take it! Nice continuation in the series. I really like it! Definitely worth a free credit. Long game, I have now gone to MAX and have completed my first garden. My Thoughts... Pros: pretty much the same game as the Halloween one, but with some really easy mini game thrown in for lots of points. New plants, flowers and man made materials. The music was fine and appropriate. No story and that is fine with me. Liked the larger items that took up four spaces. The statues and lights are nice and loved the fountain. Cons: There are not very many low lying plants, most everything is really tall and blocks lots of spaces. Especially the cherry trees and arbor. The ponds are HUGE too. I would have liked to put in water in my own design. In my next garden, I will definitely put the ponds in first. They take up tons of space. Overall, I really like this game, just as addicting as the Halloween one. Now looking forward to the Christmas version. Give it a shot, see what you think. Happy Gaming Fishies!